14.5% alc., $75. Four of the best barrels in the cellar, two from Oppenlander Vineyard and two from a Sonoma Coast Vineyard. Native fermentation, free run juice only, unfined and unfiltered. Aged 11 months in new and seasoned oak. · The unpleasant nose is lacking in fruit with aromas of brier, oak char, oiled wood and ash in the forefront. Decent core of deep red berries, currants and plum with a citrus underpinning ending with a piercingly tart grapefruit peel finish. Definitely not worth the tab. Decent (-). 14.6% alc., $40. · Dark purple color. Well-spiced black cherry and berry scent reminiscent of jam on toast. 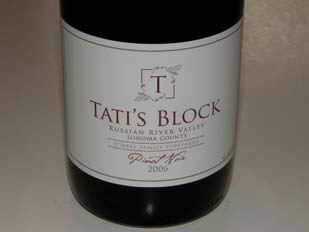 Rich middle palate of sweet cherries, berries and plums which is plush, even syrupy, but not jammy. A fruit driven wine with moderate dry grainy tannins that will find many fans. Take this handsome wax-dipped bottle (a tab is attached to the wax for easy opening) to a restaurant and you will get some attention. The best wine I have tasted from this producer to date. Widely distributed (under the Caymus family umbrella). 14.4% alc., pH 3.46, 1,336 cases, $42. Sourced from 10 blocks of the Ramal Vineyard in the Carneros appellation. Clones 115, 777, 828, Pommard 5. 100% de-stemmed, 5-day cold soak, fermented in stainless steel tanks with regular punch downs. Aged in 37% new French oak barrels for 9 months before bottling. · Feral nose of barnyard, forest floor, and smoky oak. Understated cherry core with grilled meat, smoke and oak in the background. Silky and mildly tannic with bright acidity. A shy wine that is not particularly exciting. Decent. 14.5%, $25. This bottling is a private reserve wine of the O’Neel family who sell some of their fruit to Kosta Browne. · Moderately deep ruby color. 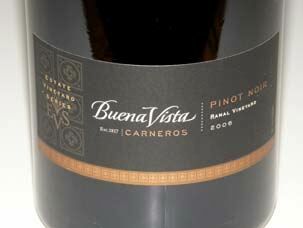 Aromas of cherries, strawberries, herbs and toasty oak. Elegantly styled with admirable acidity and supple tannins. The wine is initially herbal and oaky but sampled the next day from a previously opened re-corked bottle, had become more fruity and lost its woody qualities. Decant or cellar for a year or two. Decent (+). 14.3% alc., pH 3.66, 4,047 cases, $38. Clones 115, 667, 777, 828, Pommard 5 and Swan. Grapes were de-stemmed, cold soaked 5 to 8 days, fermentation in 5- and 7-ton open-top fermenters, aged in 39% new French oak. · Moderately dark reddish-purple color. The nose really draws you in with aromas of ripe black cherries, vanilla, and a woodsy tone of forest floor and mushrooms. Discreetly concentrated cherry and berry flavors with some pomegranate, earth and oak toast in the background. Tangy and smooth on the finish leaving a pleasant impression of fresh cherries. Very good.